The number of deaths linked to drunk passengers who wander off the platform and onto the tracks has steadily increased over the years. But a new study of these falls shows that many of them occur in the same way and that there might be a few simple ways to prevent some of them. The study was carried out by West Japan Railway Company, which explains that since drinking increases in spring, it's focusing on how to prevent alcohol-related train deaths over the next month. In a synopsis reported by The Kobe Shimbun and translated by Spoon & Tamago, the company says it amassed data and video footage from hundreds of falls over the past two years that involved drunk passengers. According to JR West, these types of falls have increased by four times in the past decade, which is why it was interested in studying exactly how they occur. The assumption was that most falls occur while the victim is walking parallel to the tracks and fails to notice how close they are to the edge. But what researchers found was that the vast majority of falls follow a totally different pattern. In 60 per cent of falls, the victim gets up from a bench and makes a beeline straight forward onto the tracks. Thirty per cent of the time, the victim is already standing upright and simply falls into the tracks. "Only ten per cent of drunks gradually drifted towards the ledge, while an outstanding majority briskly walked off the ledge as if they knew exactly where they were going," says Spoon & Tamago. The surprising results are helping the company rethink how it designs its platforms. To start with, it's making a very small, but potentially pretty important, tweak to platform seating. Instead of arranging it so that the passengers are facing the tracks, benches and seats are now orientated perpendicularly to the rails. 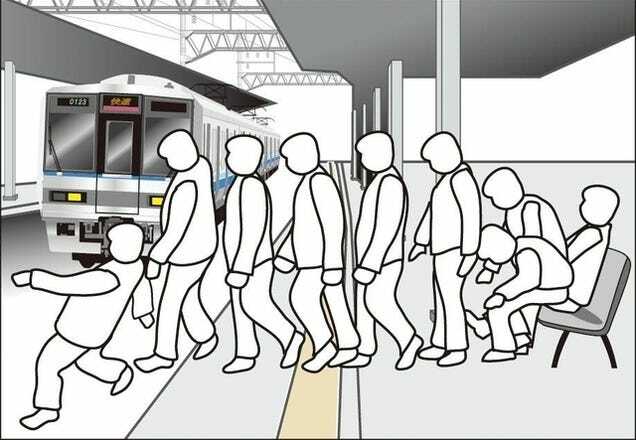 Since so many victims simply bolt upright and walk straight off the platform without realising where they are, the company hopes that something as simple as giving them more space to walk will prevent many of these accidents. JR West also says that since railway employees only have a few brief seconds to identify potential victims over video surveillance, the change will give them more time to act before an accident might occur. Obviously, these accidents are tragic, but it's amazing that they haven't been analysed more closely until now. The details of the world around us, right down to the position our chairs are in, can have outsized effects on our lives. It's just a matter of studying them.